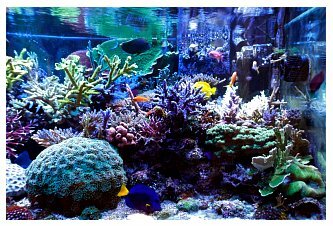 It was a pleasant surprise to see Skipper's private message last month, telling me that my tank would be featured in Reefkeeping Magazine. I was so excited about the news that I couldn't sleep well that night! 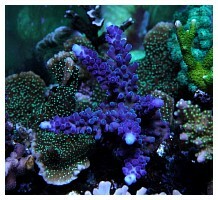 My journey with saltwater tanks started in the spring of 2002 with a 75-gallon fish-only tank, and this hobby has gone wild on me since then! 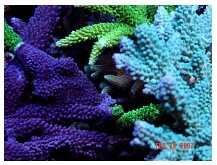 Three months later I set up a 30-gallon reef tank with the mindset that I'd keep things simple in order to keep the cost down. 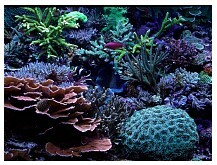 There would be no metal halides, no skimmer, no fancy powerheads or reactors,and I'd stay with mostly softies, etc. 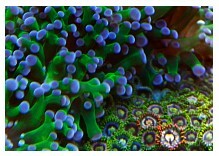 By the end of 2002, however, the 75 and 30-gallon tanks were combined into a 180-gallon with some small-polyped stony corals, two metal halides, a new skimmer and two Tunze pumps. A year later, it's been upgraded to a 220-gallon with mostly SPS, five metal halides, four Tunze pumps, closed-loops, a calcium reactor, a kalk reactor, a PhosBan® reactor, a nitrate reactor... you name it! 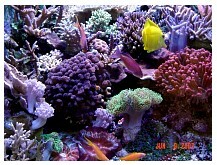 My current 220-gallon tank was set up in April 2004 when I moved into my new house. 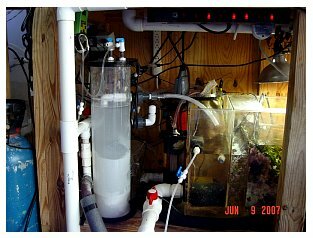 The tank was custom-built by Universal Co., measuring 6’ long x 2’ high x 30” deep with two 4” split braces on the top (I hated the 12” center brace on my previous 180-gallon tank). 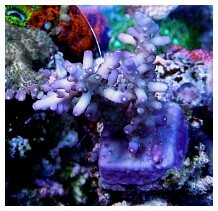 There are two small custom-built overflow boxes (6” x 2.5” x 2.5”) at the top left and right corners. I like these small boxes much better than the bulky standard size overflow boxes in my previous tank that were, in my opinion, a waste of space. There are also two 1.5” bottom drain holes and four holes on the back for the closed-loop, which is no longer in use. 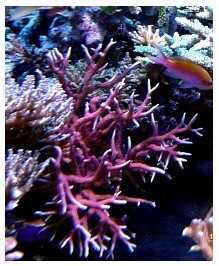 A 50-gallon sump and a 40-gallon coral fragment tank are connected to the main display tank. The fragment tank was given to me earlier this year by my popular reef friend, Invincible569, after I gave him a few frags for his new tank. 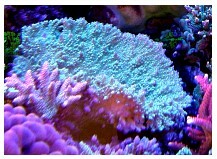 I was lucky to have a talented local reef friend and master acrylic equipment builder, Kevin (a.k.a reefalot), who helped me build the tank’s stand, canopy and all the acrylic equipment for my system, including the overflow boxes, the sump, the RO water reservoir, the salt mix tank, the skimmer, the calcium reactor, the kalk reactor, the PhosBan® reactor, the nitrate reactor, the pH holder and even the fragment tank I got from Invicible569! 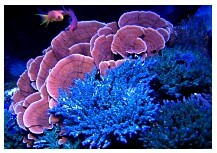 Due to his versatile skills, I was able to get my tank fully equipped in just a few weeks. 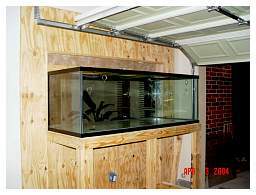 The main display tank is an in-wall tank located in the garage and viewable from the guest room. 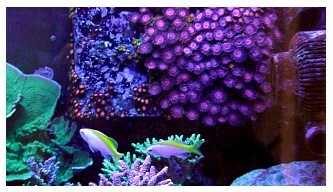 I was obsessed with the in-wall tank style after I saw Invincible’s former in-wall tank. 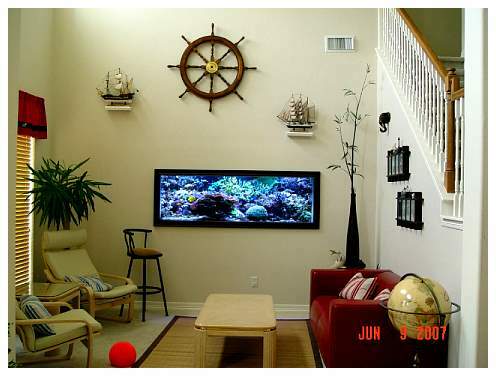 The first thing that came to my mind, therefore, when I moved to my current house was to find a spot for an in-wall tank. However, the only space available was in the garage, and choosing this location led to a lot of trouble that I’ll explain in the temperature control section. 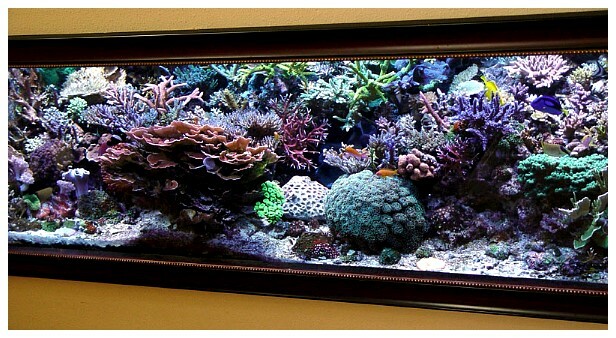 The main advantage of the in-wall tank is that it’s so quiet and neat when viewed from the front: no chiller or water flow noise, no bulky lighting pendant or hood, and foremost, no humidity inside the house. 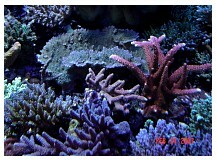 Another advantage of this setup is that water changes and tank maintenance are easy with the tank in the garage – no concern about water spills or having to carry water buckets around. 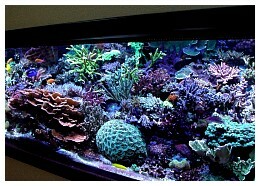 One issue I have with this in-wall tank is that it allows no access to the tank from the front. 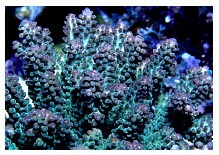 Hence, all aquascaping and coral placements have to be done from the back. Sometimes, it took me hours to arrange just a few frags because I had to run back and forth between the garage and the guest room to see whether what I had arranged from the back looked OK from the front. In retrospect, I wish I had drilled some holes in the front for access, as some people on Reef Central have wisely done with their tanks. Well, it’s too late for that now! 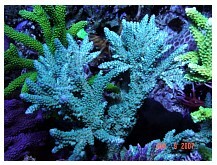 Temperature control is the MAJOR drawback of my setup that I’d like to mention here to help others with their future tank design considerations. 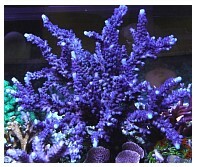 The main issue for a tank loaded with metal halide bulbs, such as mine, is Houston's hot, steamy weather during the summer. Because my garage is not air-conditioned, I have to adjust my tank’s temperature control based on seasonal temperature changes in order to save on energy bills, which typically run around $500-700 during the summer and $300-400 during the winter. In the summer, when the ambient temperature can normally get above 100°F for an extended time, the tank’s temperature setpoint is increased to ~83-84°F to keep my ¾ hp chiller from running non-stop, even though it is rated for a 400-gallon system. 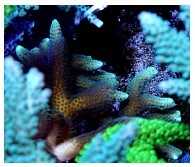 The higher temperature really takes a toll on the SPS corals in the tank every time I do this. 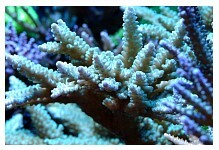 Most of the SPS turn browner, and some may even RTN. 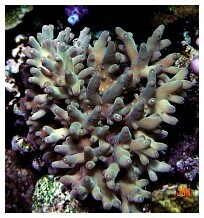 Therefore, the summer is always challenging and stressful for my corals. 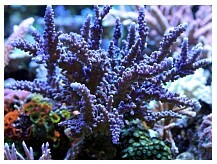 During the winter the tank is kept at ~78-80°F; the corals love these lower temperatures and usually look their best, colorwise, from December to April. 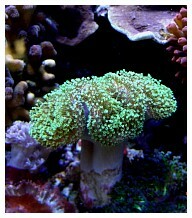 I believe my SPS corals would do much better if I could keep the tank’s temperature stable at ~80°F all year round. 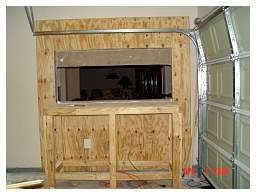 In addition, I have to leave my garage door partly open during the warmer months for the chiller’s exhaust vent. This allows all kinds of bugs (or anything that flies and is attracted to a light source) to get into the garage, drown in the tank and foul the water. In short, I’ll never set up a main tank in a garage in Houston again without an enclosed, insulated and air-conditioned room for efficient temperature control. A dual-stage Ranco controller controls the tank’s temperature by regulating a ¾ hp Tradewind chiller and four 250-watt Ebo-Jager heaters based on certain temperature setpoints. Last year I bought a Neptune AquaController 3 Pro, which has temperature control capability, but I felt more comfortable leaving the main temperature control to the Ranco controller because it has proven over time to be a reliable device. 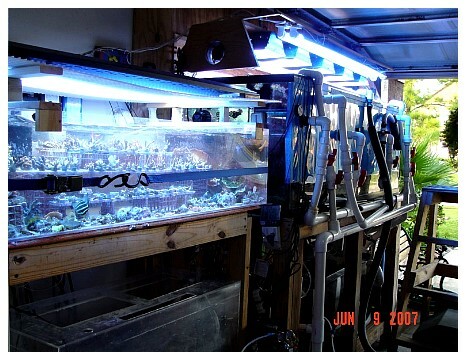 The Neptune controller is used to turn on the three 4” fans that blow across the tank’s surface when it reaches 80°F, and it turns off the metal halide bulbs if the temperature gets above 84°F. 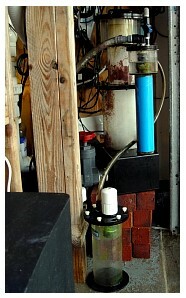 A Dolphin AquaSea 2100 is used as the sump's return pump. 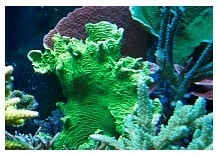 Circulation inside the display tank is provided by two 6100 Tunze streams and two VorTech™ pumps on the tank’s side walls. The two VorTech™ pumps are in the front due to their smaller footprints and are set to run at a fixed speed; I had trouble running them on timers. The two Tunze streams are on the back and are driven by a multi-controller to produce a simulated wave effect. At each corner on the back is a pair of Tunze Nano 6045 and Maxijet 1200 powerheads (with cut nozzles) to provide flow to the sidewalls, and they are powered on and off by the Neptune controller every 10 minutes. I used to have a Sequence 750 pump for the closed-loop system, but I abandoned it because the pump failed last December. The current powerhead combination provides better flow and circulation, with less heat and energy consumption, than the closed-loop system. 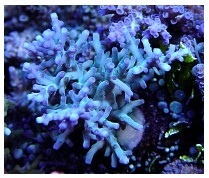 Circulation in the coral fragment tank is provided by a Hydor Koralia 4 and a Tunze Nano 6025. 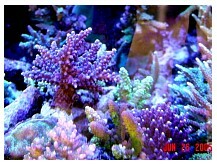 The tank’s filtration is provided by various equipment and systems such as the 50-gallon refugium, approximately 200 lbs. 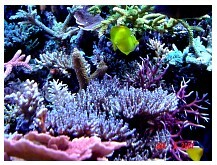 of live rock, sand beds in the sump and display tank, a skimmer, a carbon chamber and a nitrate reactor. 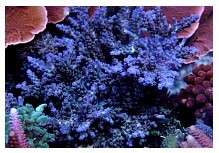 The 50-gallon sump/refugium has a 6” deep sand bed and is loaded with Chaetomorpha and a leafy macroalgae species. 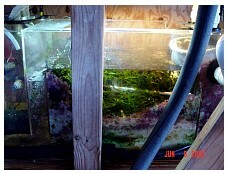 This sump is lit by two cheap 18-watt bulbs and fixtures that I bought from Home Depot. 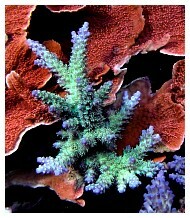 I have to prune the macroalgae pretty much every week. The main tank originally had a 3” sand bed all around, but the sand in the front was later siphoned out due to the strong flow from the powerheads blowing it around too much. 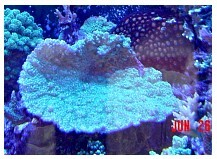 I have been using the same Beckett style skimmer that I used on my previous 180-gallon tank. 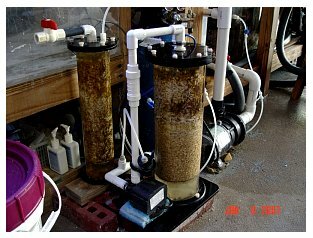 It was built by Kevin (reefalot) and still works like a champ; it works so well, in fact, that it fills the waste collector every week. 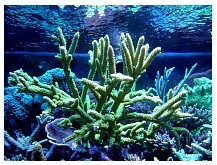 I used to have carbon, PhosBan®, Purigen™ and nitrate reactors for the first year-and-a-half of the tank’s existence. When the tank matured, the PhosBan® and Purigen™ reactors were no longer needed, so I abandoned them to reduce the tank's maintenance chores. The nitrate reactor is still running, even though it’s not needed, because it requires no maintenance. 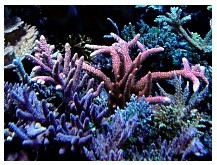 The main tank's lighting is provided by five 250-watt double-ended metal halide bulbs: three 14K Phoenix bulbs, one 10K Ushio and one 10K ReefLux, all driven by Icecap electronic ballasts. 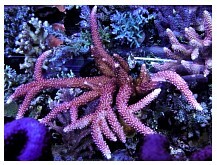 The metal halide bulbs are oriented from front-to-back to provide optimal light coverage for this 30” wide tank. 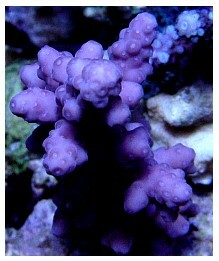 Two 6’ VHO super actinic bulbs are used for supplemental lighting. 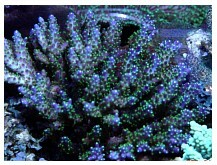 Additionally, I added two 60” T5 ATI Blueplus bulbs two months ago to provide extra lighting to the very back end of the tank. I like the Phoenix bulbs for their blue spectrum, and the 10K Ushios for their crispy white appearance. 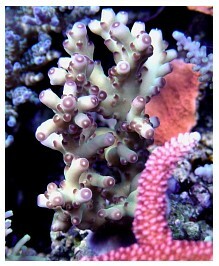 The 10K ReefLux is a little too pinkish to me; a friend mentioned that I might have received a faulty bulb. 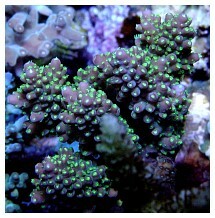 Anyway, I’ll stick with the Ushios for 10K bulbs in the future. 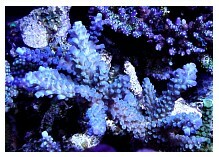 I also like the T5 ATI Blueplus bulbs because they add a bright, bluish look to the tank. In the future, I may add more of these T5 bulbs and reduce the number of metal halides. 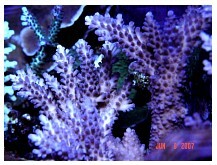 The metal halides' photoperiod is cut back 1-2 hours during the summer. The three 14K metal halide bulbs are controlled via the Neptune controller, which turns them off when the temperature exceeds 84°F. 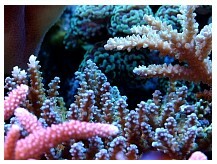 The main source of supplements are my weekly water changes, which seem to be well received by my SPS. 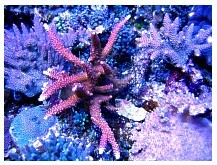 I use a mixture of 60% Tropic Marine and 40% Oceanic salts. 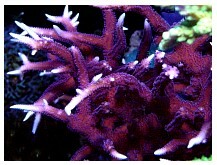 Calcium is provided by a dual-chamber calcium reactor system. 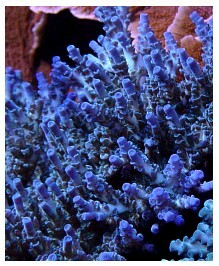 The second chamber was added later as the corals' calcium demand increased. 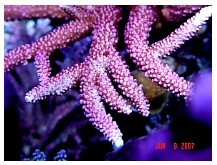 CaribSea’s ARM media (the coarse size) is used as the calcium reactor’s media. I like the large sized media because it doesn’t plug up the chamber as often as the smaller types do. The outlet from the reactor to the tank is a steady stream (not droplets) to prevent clogs in the ¼” tube, and to keep up with the tank's calcium demand. A Milwaukee pH controller regulates CO2 addition with a setpoint of pH 6.6 on the reactor’s effluent. If the tank’s pH drops below 7.9, the Neptune controller turns off the CO2 solenoid valve, no matter what the pH controller calls for. An oversized kalkwasser reactor is used to supplement calcium levels and to maintain the pH at around 8 - 8.2. The kalkwasser is added to the tank via a dosing pump; I don’t trust adding kalkwasser via top-off solenoids as some people do. The kalkwasser dosing pump is turned on and off as pH drops below 8.15 and above 8.16, respectively. A CAP-1200 powerhead is submerged inside the kalkwasser chamber to stir the kalk powder at the bottom of the chamber according to a set schedule from the Neptune controller. 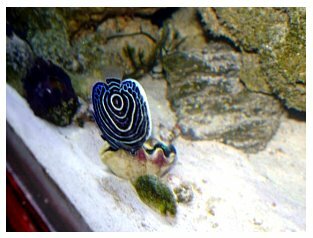 My weekly tank chores include doing a 15% water change, cleaning the skimmer’s neck and dumping the full waste collector, pruning the macroalgae and cleaning the salt creep on the center braces. 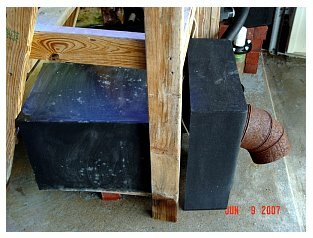 A 30-gallon salt mix reservoir is automatically filled by my RO/DI unit. 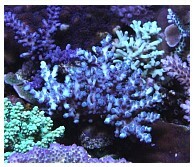 I try to make a new batch of saltwater right after each water change, so that I always have new salt water ready to perform a water change any time it’s needed. I recently began using filter bags on my overflow drains and found that these keep my refugium much cleaner and easier to maintain; the tank’s water also looks more polished with the filter bags. These bags are cleaned weekly with a garden hose. 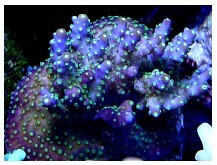 I like the Neptune Aquacontroller 3 Pro that I bought from a local hobbyist last year. 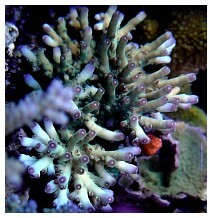 It allows me to watch my tank’s pH and temperature fluctuations over time and make adjustments as needed. But perhaps the main benefit I get from this controller is that it makes me feel more comfortable when traveling because I can check my tank’s parameters from anywhere in the world, as long as I have an Internet connection. 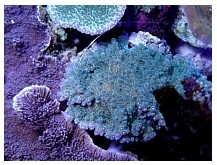 As my corals grow, I also have to trim them occasionally. 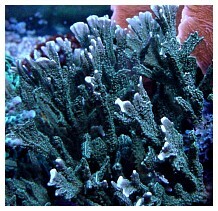 Earlier this year, I had trouble with Dictyota algae, which hitchhiked in on the Bali cultured corals, and had to cut way back on feeding. 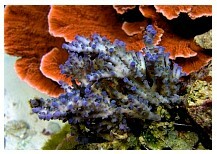 This caused many of the small-polyped stony corals’ color to turn very light. 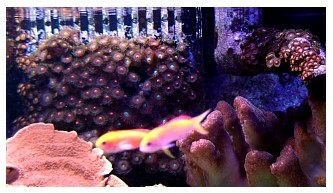 Fortunately, I found the blond Naso tangs that eat this algae, and that’s why I have two Naso tangs in my tank now. 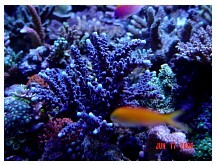 Before I added the Naso tangs, however, I bought a rabbitfish that some on Reef Central had claimed ate Dictyota in their tanks. This turned out to be a complete disaster for me! 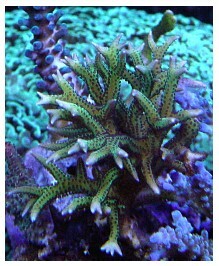 The rabbitfish didn’t touch the algae but wiped out all the nice zoanthids that I had growing on the overflow boxes and along the back wall. 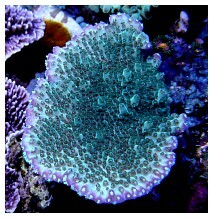 It also ate all the blue zoanthids that I bought recently, as well as any mushroom in sight! It took about five weeks to finally lure it into a fish trap - what a great relief, as I was about to give up on using the trap and planned to drain the tank down to catch that fish! 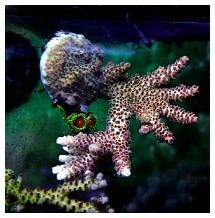 With the Naso tangs' help with clearing the bothersome algae, I have gone back to daily feeding now. 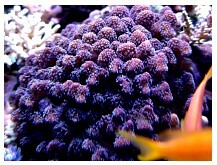 Typical food offered consists of a mixture of frozen brine shrimp, Mysis shrimp, some Cyclop-Eeze® (for the Anthias) and a variety of flake food. 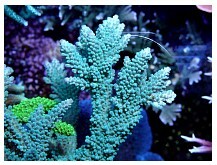 Occasionally, the frozen food is soaked in Selcon™ for a few minutes before feeding. 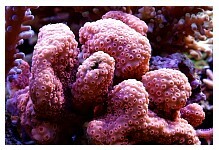 In addition to feeding the fishes, I recently have started to add either oyster eggs or Golden Pearls™ every other day for the corals, which seem to enjoy the extra food. 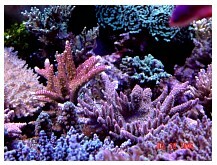 Over time, my tank has become a small-polyped stony coral dominated tank, with some large-polyped stony corals (i.e., a hammer, frogspawn and brain coral) transferred from my original reef tank that I have become attached to. 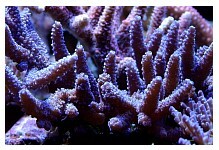 There are so many types of SPS in the tank that I’ll not try to list them all here; I’m not good at identifying the SPS species anyway. 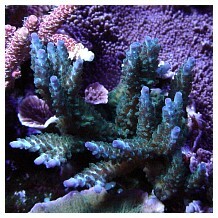 My favorite SPS corals are the strawberry staghorn and purple slimer I got from Overboard on exoticreef, and the blue bottlebrush I got from a local reefkeeper. 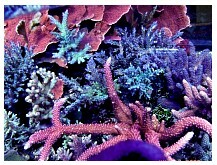 I started to collect different types of zoanthids last year and planned to have them cover the sand bed in the front, as well as all of the tank’s back and side walls. As mentioned earlier, however, the recent incident with the darned rabbitfish has pretty much pushed that idea back to ground zero for now. 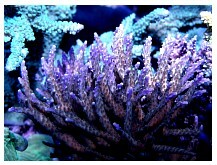 My favorite fish is my Purple tang, which I bought in 2003 from a local reefkeeper who had already had him for 3½ years; so this tang is at least seven years old and is the most senior fish in my tank now. He eats right from my hand like a pet. 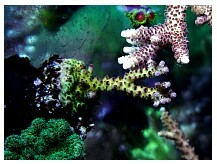 Sometimes I had to literally grasp him by hand to move him out of the way when I worked on moving the rocks or corals, because he kept jumping into the turned over rocks or coral bases to get at the algae. The moment I released him from my hand, though, he would swim right back to the rocks. 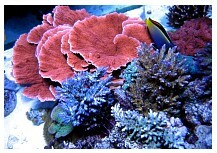 I have three Six-line wrasses in the main tank now to guard against unwanted pests (flatworms, red bugs) even though they are quite aggressive and limit my choice of wrasses. 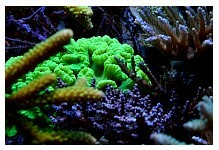 One of my favorite activities involving the tank is to take pictures of my corals over time to document their growth. 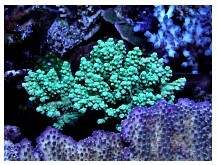 I was surprised to realize how much the corals have grown when looking back at the older pictures. 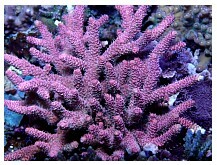 Third row: strawberry staghorn from 6/06 - 6/07; Bottom row: A. efflorescence from 6/05 - 2/07. 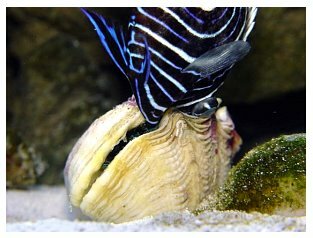 One of the more popular pictures of my tank: an Emperator angel killed in action by a clam! 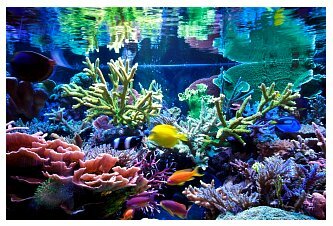 I would first like to thank Skipper and Reefkeeping Magazine for giving me this opportunity to share my tank and experiences with others. 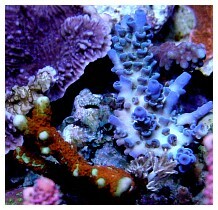 I also appreciate the great help and support I’ve received from my family, my longtime reef friends such as Invincible 569, reefalot, Naka, menwaylo, chadhender,… as well as many fellow hobbyists at my local reef club (marshreef.com). 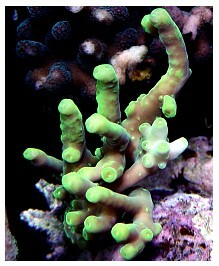 At times, I had thought about tearing down my tank due to the never ending trouble associated with an SPS tank, such as mysterious RTNs, crazy algae blooms, stubbornly browned-out SPS, red bugs, Montipora nudibranchs, equipment failures, etc… It was these good friends who talked me out of those thoughts and I see the better results today. Also, many thanks to Naka, mphan, Tommy108 and rockdr for the great pictures they’ve taken of my system.